JAMES FARQUHAR. 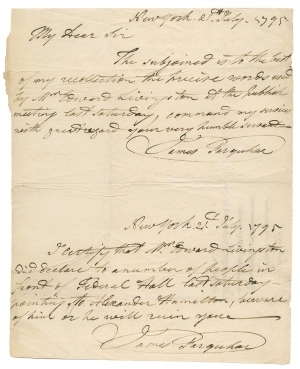 Autograph Document Signed, with ALEXANDER HAMILTON, Autograph Note on verso (though struck out), July 21, 1795. 2 pp. I certify that Mr Edward Livingston did declare to a number of people in front of Federal Hall last Saturday, point to Alexander Hamilton, beware of him or he will ruin you. 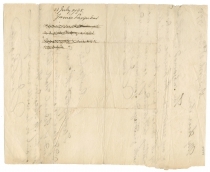 James Farquhar (1742-1831) was born in Scotland and came to New York by 1757. He went to sea and served as a master of ships until 1774, when he married Elizabeth Curson and settled in New York City. He became a wine merchant and a vestryman at Trinity Church from 1784 to 1801. He served as a second in a duel in 1786. In 1800, he was appointed Warden of the Port. In the early nineteenth century, he led New York’s assembly dances (forerunner of debutante balls). The Livingston cousins were all members of the prominent New York family which had migrated from Scotland in the seventeenth century. Edward (1764-1836) graduated from the College of New Jersey, and was an attorney, a Congressman from New York (1795-1801) and leader of the opposition to Jay’s Treaty, U.S. Attorney for New York, and mayor of New York City (1801-1803). Later, he served as Congressman (1823-1829) and U.S. Senator from Louisiana (1829-1831), and as U.S. Secretary of State (1831-1833). James (1747-1832) served as a colonel in the Revolutionary War and represented Saratoga in the New York State Legislature (1783-1794). Henry Brockholst (1757-1823) graduated from the College of New Jersey (Princeton) and served as a lieutenant colonel in the Revolutionary War. He was private secretary to John Jay (1779-1782), attorney in New York (1783-1802), judge of the State Supreme Court (1802-1807), and associate justice of the United States Supreme Court (1807-1823). Maturin (1769-1847) was a graduate of the College of New Jersey, an attorney, and a delegate to the New York State Constitutional Convention of 1801. 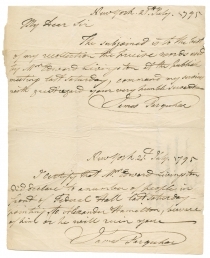 Edward Livingston to Margaret Beekman Livingston, July 20, 1795, New-York Historical Society. The New-York Gazette and General Advertiser (New York, NY), July 20, 1795, 3:1.